Perhaps the most understated description of X-Moto I’ve heard to date is that it is a “challenging 2-D motocross platform game”. Challenging is putting it mildly, it is the Angry Birds of the open source gaming world. Perhaps I should back up a bit. 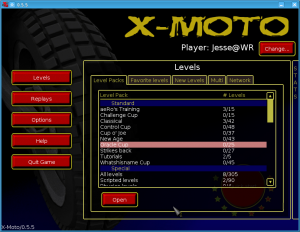 X-Moto is a 2-D motorcycle driving game in which the player is tasked with manoeuvring the bike around a series of platforms and obstacles. Each level typically has a number of goals we are to reach and there is a final checkpoint that signifies the end of the level. While there is not any time limit on the levels there is a clock keeping track of how quickly we complete a level in case we wish to compare our performance with other players. The controls for X-Moto are quite simple. The Up and Down arrow keys cause the bike to speed up or slow down. 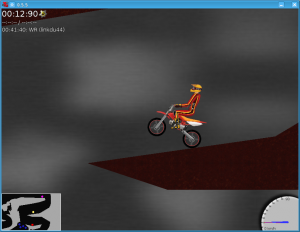 The left and right arrow keys cause the player’s avatar to lean forward or back, adjusting the attitude of the bike. The spacebar causes the player to change direction. This is all deceptively simple on the surface. Where X-Moto gets interesting is in the unforgiving nature of the game and the cruel level design. 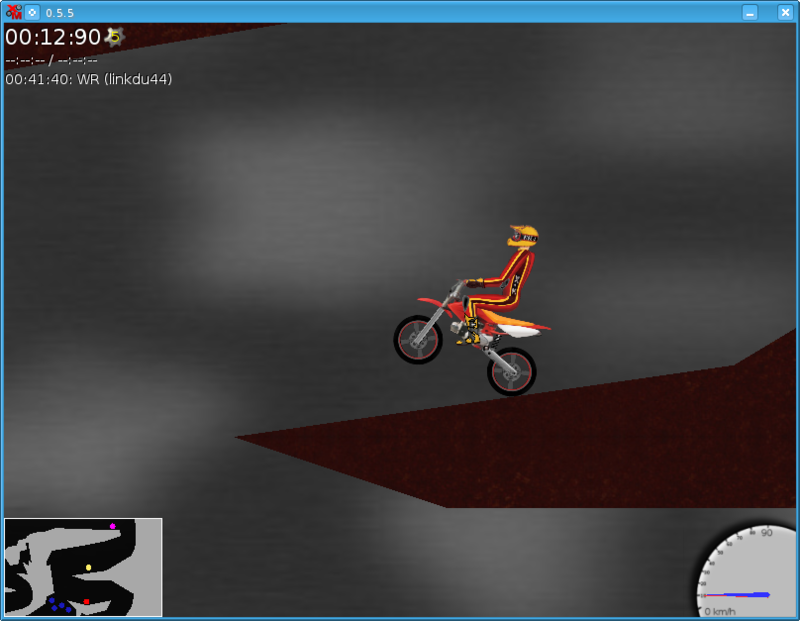 The player, while navigating each level, must take care not to let the bike’s rider come to any harm. Hit your head and the level restarts. Fumble a jump and the level restarts. Accelerate too quickly and flip over backward and the level restarts. Bump into a wall at the wrong angle and the level restarts. I am sure you are starting to see a pattern. The design of the levels is often sadistic in nature. Quite often the player must manage to navigate through a maze of obstacles and peril, only to turn around and run the course backward. The levels are typically small in size, but filled with chances for mishap and there are not any save/restore points. The game is, in its cruel way, fun. The variety of the levels and the seemingly simple (until one tries them) courses keep the player coming back for punishment again and again. I quickly lost track of the number of times I almost managed to complete a jump, a turn, a loop…. Being so close again and again brings the player back to try just one more time, over and over again. Besides some devious traps in the levels and the lack of save points, X-Motor has one more trick up its sleeve. The game’s controls, the arrow keys, are very sensitive. A quick tap of a key is enough to throw the bike off balance. Some levels I survived less than five seconds when I accelerated too quickly or over-corrected a jump. The game demands a light touch. All of this may make it sound as though I do not like X-Motor and that isn’t true. The game is teeth-grinding, pulse-quickening difficult, but it is fun. At least if you don’t mind the unforgiving difficulty curve. This is not a game that believes in slowly regenerating health or offering a helping hand. You get thrown in and the game sits back to watch you sink or swim. Personally, I found the lighthearted graphics, the unique platform challenges and the difficulty a positive experience. I do highly recommend starting with the tutorial levels as starting with the regular levels is (as I found out) a tough way to learn. The tutorials at least give the player some breathing room. I also suggest randomly playing through the levels. Trying to march through the levels in order will give a really weird difficulty curve, but mixing and matching levels from different campaigns shows off the variety the game has to offer and breaks up the difficulty. In fact, letting the player try any level at any time, rather than forcing us through levels in a set order, may be one of the game’s bigger strengths. It makes the game feel more like a showcase of art, platforms and challenges instead of a series of hoops through which we must jump. 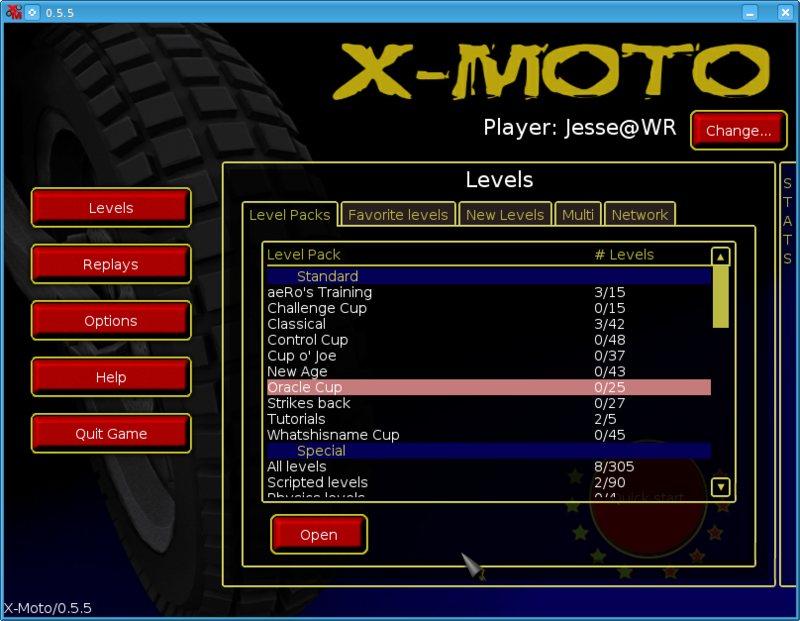 If you are up for the challenge, then give X-Moto a try. … Just do not attempt the game if you already have high blood pressure!